CGA Engineers worked along with the architect and other professional disciplines to assist Cherokee Nation in locating and developing the new Cherokee Nation Food Distribution Center in Nowata, Oklahoma. The new Food Distribution Center will be located on the south side of Nowata, OK and on the north side of the recently constructed Cherokee Nation Health Clinic. The scope of the project included working with Cherokee Nation and the professional team to select a location on the site for the new building and parking, surveying the site, and producing civil contract documents for the construction of the new facilities. The civil contract documents included site layout, grading, stormwater drainage, paving, utility extension, and erosion control. 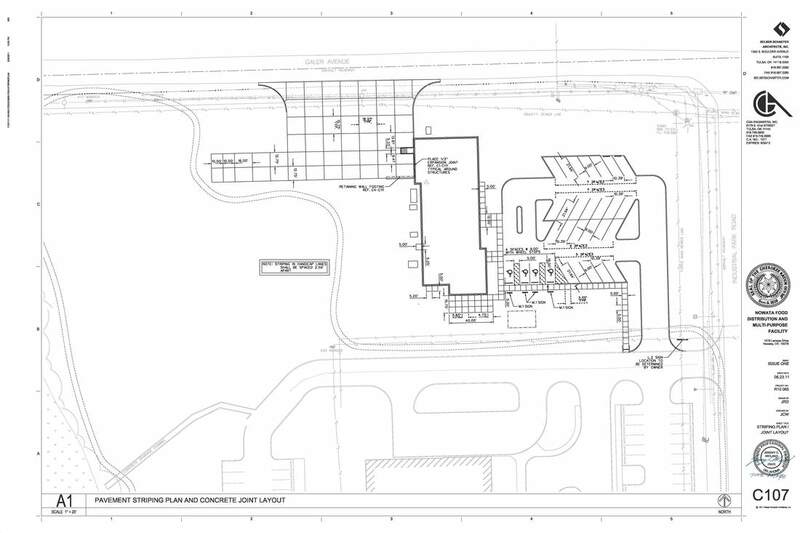 The site layout and grading design accommodates the newly designed 7,700 square feet building, 25 stall parking lot, and semi-truck loading area. The designed site meets all Americans With Disabilities rules and regulations. The utility extensions include domestic water, sanitary sewer, and natural gas. CGA Engineers coordinated efforts with the town of Nowata to ensure that the final site layout, grading, drainage, and utility extensions met its requirements. Working with Nowata during the design of the project allowed for them to provide direction that will ensure that possible conflicts with the town are removed before construction starts. CGA Engineers developed a complete and ready to use Stormwater Pollution Prevention Plan (SWP3) for the project. Once the contractor is selected, all he/she will have to do for the SWP3 is fill out the Contractor's information in Notice of Intent located within the SWP3 and submit it to the Oklahoma Department of Environmental Quality. All the research for the SWP3 was completed by CGA Engineers.